Representatives of universities of China, Serbia and regional countries gathered at the "China-Serbia Higher Education Seminar and Exhibition" on Wednesday. Representatives of universities of China, Serbia and regional countries gathered at the "China-Serbia Higher Education Seminar and Exhibition" on Wednesday in order to discuss ways to promote student mobility and the development of internationalization. The seminar entitled "Promoting student mobility between Serbia and China with Internationalization Development" and the exhibition "Study in China" including presentations of 35 Chinese universities were opened at the rectorate of the University of Novi Sad by its rector Dejan Jaksic, Li Chunsheng, Deputy Secretary General of the China Education Association for International Exchange (CEAIE), Yuan Jigang who is in charge of education at the Chinese embassy to Serbia and Zoran Milosevic, provincial secretary for Higher Education and Scientific Research of Vojvodina (autonomous province of Serbia). According to Li, the aim of the event is to connect representatives from Chinese universities with their counterparts from Serbia, as well as Slovakia, Macedonia and Croatia in order to discuss their programs and projects. According to him, academic cooperation between the two countries has been developing quickly, "today the level of student exchanges and language learning deserves respect. The number of Serbian students in China in 2017 was 446, while 14 Chinese students studied in Serbia," he said, continuing that Serbia now has two Confucius Institutes and two Confucius classrooms, while four universities have offered Serbian language as majors. "Moreover, Serbia is a very important member of the 16+1 platform for cooperation between China and Central and East European Countries (CEEC), which gave an immense contribution to the development of academic cooperation and exchange in the area of higher education between China and these countries," he said and reminded that the University of Novi Sad since last year holds the CEEC headquarters of the Secretariat of the Higher Education Institutions Consortium for cooperation between China and 16 CEE countries. Talking about Chinese presence in Serbia, Jaksic hoped "that the next wave will consist of students interested to learn about our culture, history, heritage besides different areas of natural and social sciences". "Chinese universities are making progress by various parameters and I am sure that our students have a lot to learn from the Chinese partners," Jaksic said, reminding that the University of Novi Sad so far signed agreements with 15 Chinese universities. "In recent years, the University of Novi Sad invested significant efforts to contribute to cooperation of Central and Eastern Europe with China in the area of education," he said, announcing that the University of Novi Sad has been proclaimed as the best partner in 2018 by the CEAIE, which is according to him "great honor and a recognition of past work, as well as an obligation to actively advance cooperation in the future". 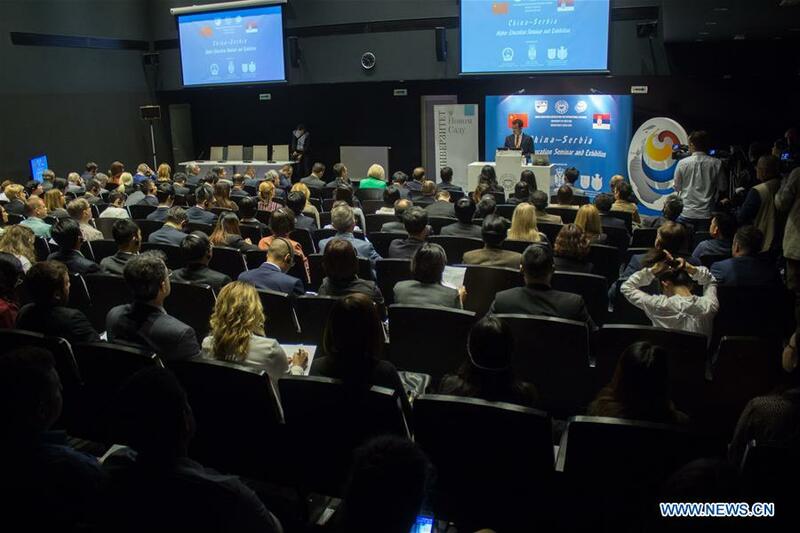 Yuan said that the seminar and exhibition promote educational cooperation between China and Serbia, estimating that "cultural and educational exchange are a booster for developing the relations between countries and a lubricant for increasing mutual trust and dispelling doubts". He estimated that through the recently-established 16+1 Higher Education Institutions Consortium, "countries can make good use of their complimentary advantages, increase student and scholar exchanges, implement youth exchange programs, establish joint laboratories and centers for regional studies, cooperate in running schools and jointly cultivating high-quality professionals". "In the new stage of historical development, we look forward to closer cooperation with Serbia as well as other CEE countries. By strengthening our ties in the field of education, we will contribute to create a new generation of Chinese and Serbian people who have even better understanding towards each other," Yuan concluded. After the seminar, dozens of interested students and scholars toured the exhibition inquiring about conditions to enroll at Chinese universities and the course of studies. As part of "Going Global Strategy ", the seminar and exhibition aim to provide a platform of service and cultural exchange for young people of countries along the Belt and Road.